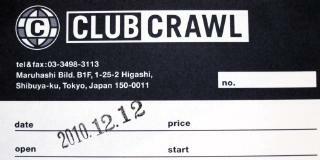 The Age Age Idol Carnival was a very long minor idol event that took place in Club Crawl (in Shibuya). Club Crawl was a small live house. Unfortunately it wasn't non-smoking. There were around 40 people in the crowd. The Maru Maru Gakuen Housoubu stage started at 12:30, and lasted for around 15 minutes. Nine of the Maru Gaku girls appeared, everyone except Amano Miki. Everyone was wearing the new white winter outfits. White sweaters and skirts/shorts and white boots. Nao and Yuki wore shorts, the other girls wore skirts. The first song was "Motto Motto Tokimeki". 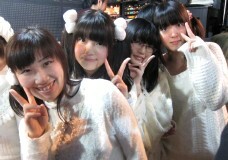 There were three wireless mikes held by Haruka, Kanako, and Tomoko. They quickly went to the next song which was "Seijuu Sentai Gingaman". 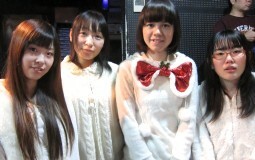 The mikes were held by Yuki, Miki, and Megumi. After the second song, all the girls lined up and quickly introduced themselves. Then they made a few announcements. There are new photos for their goods, two for 100 yen. Also they have a promo video DVD for the special "live only" price of 500 yen. The usual price for the DVD is 1200 yen. The last song was "Mizonokuchi Taiyouzoku" (溝ノ口太陽族). The mikes were held by Saori, Kana, and Nao. After the event, the performers sold goods. Since there were so many performers, and the hall was pretty small, it was very crowded. At the Maru Gaku table, they sold a set of 2 photos per girl at 100 yen per set. There was also a promo video DVD for 500 yen. 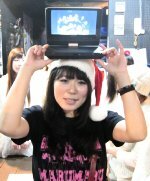 Itou Asuka (伊藤あすか) (the producer of Maru Gaku) came out wearing a black Maru Gaku T-shirt and a Santa hat to try to sell the DVD. She had a portable DVD player and was playing the DVD on it. I bought photos of each girl (10 x 100 yen) and the DVD, for a total of 1500 yen.